• 5th position in Team at the 17th Asian Games Incheon held at Incheon, South Korea in 2014. 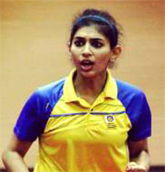 • Bronze Medal in team event in the Golden Racket International TT Tournament held at Vietnam from 23-26th July 2014. • Gold medal in teams and doubles in Fajr Cup help in Iran from 23-26th Jan 2014. • WonBronze Medal inDoubles in 19thCommonwealth T.T Championship held atNewDelhi in 2013. • Won Bronze Medal in Team in 19th Commonwealth T.T Championship held at New Delhi in 2013. • Participated in LIEBHERR World T.T Championship held at Paris, France in 2013. • Gold Medal in doubles 2009 Comonwealth Youth Games held in Pune. • Gold Medal in Doubles, Silver in Teams and 15th Position in Singles in The ITTF World Cadet Challenge held in Santo Domingo, Dominican Republic from 23rd – 30th Oct. 2005. Received a Special Player Award (female) for exceptional leadership qualities. • Participated in 4 World Junior Championship from 2005 to 2008. • Bronze Medal in team events in the 12th Asian Junior T.T Championship held at Kityakyushu, Japan from 25th to 30th July, 2007. • Gold Medal in the All India Inter Unit PSPB T.T Tournament held in Goa from 17th to 21st January 2013. • Gold Medal in team events in the Senior National and interstate T.T Championship held in Raipur from 7th to 12th January, 2013. • Bronze Medal in Singles in the Senior National and Inter State T.T Championship held in Raipur from 7th to 12th January, 2013. • Silver Medal in Singles and Mixed doubles in Maldives Golden Jubilee Invitational tournament 2010. • Participated in 2006 and 2008 World T.T Championship held in Germany and China. • Two Gold Medals in U-21 and Women Singles in National Ranking T.T Championship held in Patnain 2007. • Gold Medal in Team Events and Silver Medal in Doubles in The Stag Canadian Open T.T Tournament held at Montreal, Canada from 12th to 15th April, 2007. 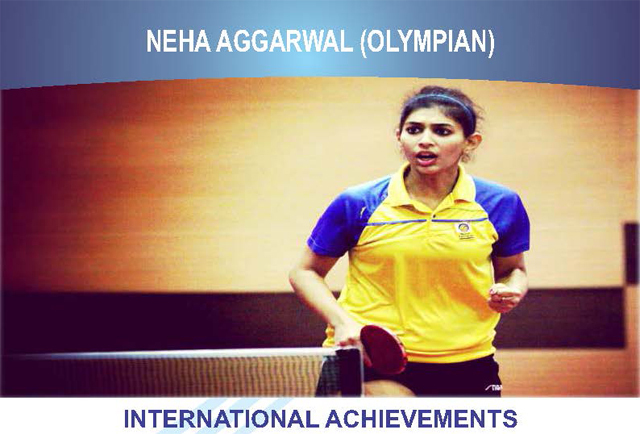 • Silver Medal in Team Events and Bronze Medal in Doubles in SAIL 2006 India Junior Open T.T Championship ITTF WJC held in Kolkata, India from 21st to 24th June, 2006. • Gold Medal in Team Events, Silver in Doubles and Bronze in Singles in the 2nd Doha Junior Open T.T Championship held in Doha, Qatar from 24th to 28th Jan, 2006. • Bronze Medal in Team Events and 6th Position in Singles in the 2005 Tiyuan International Junior Open T.T Championship held in Tiyuan City, China from 25th to 30th August, 2005. • Bronze Medal in Single in the 11th Aisan Junior T.T Championship held in New Delhi from 23rd to 28th July, 2005. • Gold Medal in Singles, Doubles and Team Events in the 11th South Asian Junior T.T Championship held in New Delhi from 20th to 22nd July, 2005. • Bronze Medal in Team Events in the ITTF WJC Fiji Open Junior TT Championship held in Fiji Island from 23rd to 27th Juny, 2005. • Bronze Medal in Team Events and Mixed Doubles in the IIIrd International Sports Games “Children of Asia” held in Russia from 24th to 28th July, 2004. • Gold Medal in Singles and Doubles in the 2002 Tiyuan International Junior Open T.T Championship held in Tiyuan City, China from 25th to 30th August, 2002. • Rajiv Gandhi State Sports Award 2009. • Member of ITTF Athletes Commission 2007-8 as Junior Girls representative: responsible to voice & discuss the various problems faced by the female T.TPlayers under the age of 18 in the World. • Sports Secretary of DPS R.K. Puram 2006-07. • 2005 Player of the tournament in Junior National Championship in Shiliong. • Delhi Sports Journalist Award as Best Sportswomen (T.T) 2002. Write thought provoking articles on issues in the sport of table tennis for the official website ww.ittf.com. • Travel to tournaments worldwide to report the matches on both website and social media platforms. • Interview players, coaches and officials for the website & social media platforms. • Courtside commentator for ESPN3 and ESPN2 for the 2016 Women’s World Cup at Philadelphia, USA. This was the first time ESPN broadcasted Table Tennis LIVE in the US. • Color commentator for the first ever live broadcast of 2016 US Open Table Tennis Championship on Facebook and YouTube. Final 2:15 hour show reached 1.2 million home feeds on Facebook, with 9,600 live viewers and 40,000 unique visitors to the website in 24 hours. At the end, the live broadcast earned 200,000 views, 6,000 comments, 3,800 shares, 6,600 likes and reactions. • Assisted with the development of marketplace overview & business development strategy including sizing new opportunities, creation of an overall business strategy and account plan for Olympic Training Center. • Worked closely with clients (for profit companies) to plan and execute events at the Olympic Training Center that helped promote the mission of the USOC and the working of the Olympic Training Center. • Prepared briefs for Director of Business Development and cross-departmental teams on the business strategies and performance of the Olympic Training Center. • Worked cross departmentally to identify & develop new ideas and assets that meet both corporate partner goals and USOC objectives leveraging the Olympic Training Center. • Strategized and implement ideas for USOC sponsors, corporate partners and outside users to utilize the Olympic Training Center effectively to generate additional revenue for the US Olympic Team. • Created a marketing strategy for the Athlete Speakers Services leveraging the Rio Olympics. • Created an external communications and social media plan for the Athlete Leadership Connection event. • Analyst for foundation’s Social Media platforms and website; created strategies to improve both social and digital presence of the foundation. • Supported marketing, sponsorship and table sales efforts for the Annual Fundraiser Dinner in NYC. • Wrote original articles on life of an Olympian for the SHE network. • Created an effective travel &training grants program that funds the US Women Olympic athletes. • Developed marketing and branding strategies to build public awareness for the Foundation and its mission. Assisted the Associate Athletics Director for Corporate Sponsorships in researching potential sponsors for Columbia Athletics. Attended client meetings and provided support for sponsorship activation ideas. • Handled ITTF’s Social media accounts: Facebook, Twitter & Instagram & Snapchat. • Facebook stats: reach -3.3 million, up by 35%, engagement rate was up by 29%, Video Views up by 64% & page likes up by 42%. Twitter stats: Over 1.8 million impressions in 8 days,198.2K impressions per day. • Member: The Perfect Game Foundation. • Cricket All Stars Press Conference, November 2015: Managed backstage during the conference and assisted in the handling the media area. • Lead Speaker, Sports for All Conference 2014, PHD Chamber of Commerce and Industries: Part of the panel discussion on challenges faced by sports persons in India. • Chief Guest and speaker at various sports meets in leading schools and colleges across India.